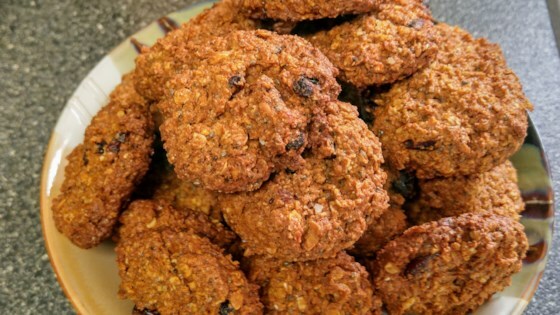 "An easy way to incorporate chia seeds, these delicious cookies contain no eggs or butter and are easy to make. Cookies will be soft; allow them to cool completely." Combine oats, brown sugar, flour, chia seeds, cinnamon, baking soda, baking powder, and salt in a bowl. Stir applesauce and coconut oil into oat mixture until dough is evenly mixed. Fold cranberries, chocolate chips, and coconut into dough. Spoon dough onto the prepared baking sheet. Bake in the preheated oven until edges of cookies are lightly browned, 10 to 15 minutes. These are amazing!! I followed the recipe as written, except without adding the craisins or coconut. I added 3 tbsp of cocoa to make them double chocolate cookies!